Integrated resource planning provides a foundation and roadmap for progressive forest management. IRM offers a suite of planning services for landowners (large or small) interested in a sustained flow of timber revenue. IRM can also create management systems for land trusts and other landowners whose goals center on biodiversity and use of forestry as a restorative tool. Forest Projection System (FPS) is an integrated forest inventory, growth and yield model and harvest scheduling program. 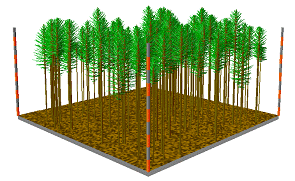 Stand Visualization System (SVS) is a computer based imaging program which provides a graphic display (shown below) at the stand level of forested stands including trees, snags, and understory vegetation. 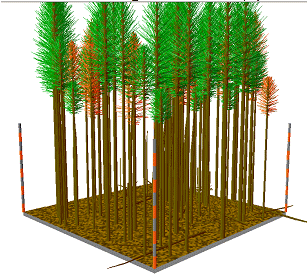 Coupled with an inventory and growth modeling program such as FPS, SVS allows the viewer to “see” the development of a stand from planting through various silvicultural treatments to full maturity. EnVision is designed to be a full featured rendering system for stand-and landscape-scale images. Applicable projects range from a few to several thousand acres. 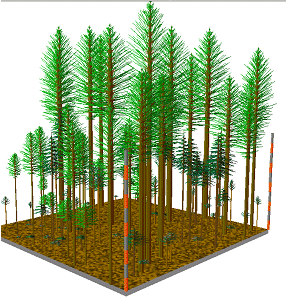 Basic components of an EnVision project include a digital terrain model to define the ground surface, color and texture maps to define ground surface characteristics, and groups of objects or “actors”. EnVision is a useful tool to visualize the effects of different harvest regimes at the stand and landscape level. Geographic Information Systems mapping (GIS) is an automated computer mapping program for the capture, storage, retrieval, analysis, and display of spatial data. IRM uses the latest version of ArcView; the industry standards for highly accurate and functional spatial analysis and map making. Global Positioning Systems (GPS) uses satellite signals to provide highly accurate locations in the field. This technology is used to collect mapping data for incorporation into a GIS system. Growth and Yield Models IRM uses ORGANON, DFSIM, and the FVS computer-based growth and yield models. Visit our Projects page for examples of Forest Management projects implemented by IRM.